You've heard the old saying: "Birds of a feather flock together"? Well, the same is true when they gather on wires - that is, before they get zapped and fly away! On their own power lines, players arrange birds into sets of three, trying to create the best scoring combinations. Your birds need to be of the same colour, the same size, all different colours, or all different sizes. But watch out! In this game of migrating birds and shocking zaps, scores go up and down and you won't know until the very end if you have won! 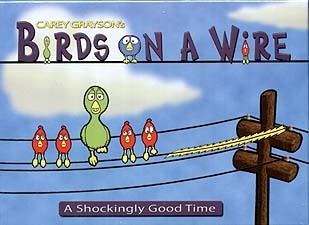 Birds On A Wire includes two sets of rules: one for families with children 7 and up; and another for more advanced play. Either way you play, you're in for a shockingly good time!